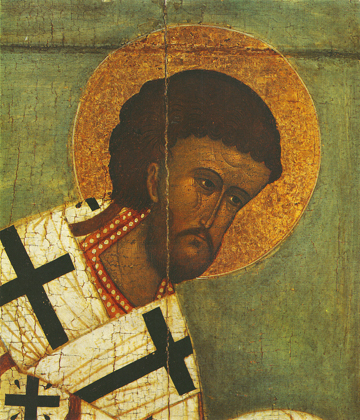 St. John Chrysostom is shown here radiant and merciful in this beautiful detail from a Russian icon from Yaroslavl. St. John was born in Antioch, Syria in a.d. 347 and was well educated in classical learning. After much study of the Greek philosophers, he rejected their limited view by embracing in baptism the fullness of the Christian Faith and Its life-giving grace, which gives a blessed life on earth, and an eternal life in Heaven. St. John became a monk after his parents died and he lived a strict ascetic life. Both he and Flavian, the Patriarch of Antioch, received an angelic vision to call St. John to the priesthood. When his Heavenly words went out to the Faithful, all sensed the blessedness within them, and thus he was referred to as Chrysostom, which means “Golden mouth.” His writings and sermons are remarkable in their insight and beauty even today. Later he was chosen as Patriarch of Constantinople, which he served for six years before being exiled due to intrigue by his enemies and the Empress Eudoxia. Reinstated for a short time, he was then sent to Armenia, being driven without rest until he died of exhaustion in a.d. 409.